Whether you have a backyard companion or an international competitor, you’ve invested a lot of time, energy and effort to keep your horse in optimum health for peak performance. Horses are natural-born athletes, yet we ask them to do a lot that their bodies weren’t built for. Training and competing in any discipline demands much more of our horses’ joints and bodies. Circles, lateral moves, slide stops, pivoting and jumping are among the activities that can increase your horse’s risk for developing a wide range of problems. The right joint supplement for horses is critical to reducing the risk of these problems. It can help protect your investment and, equally important, keep your horse comfortable while doing all that you ask of him; now and for the long haul . The correct levels of essential joint support ingredients are the key to choosing the right supplement, but before we talk about what’s in the bottle, let’s talk about what’s in the joint. Whatever the species, the basic structure and function of all mammalian joints is similar in that articular cartilage covers and protects the ends of the bones. This cartilage provides a smooth, low-friction gliding surface that allows free movement of the joint. Articular cartilage is made up of water, collagen and a complex group of proteins called “proteoglycans” which consist of hyaluronic acid and long chains of “glycosaminoglycans”, often referred to as “GAGs”. Proteoglycans trap and hold water, forming a cushion of dense fluid at the ends of the bones that enables movement and absorbs shock when the joint bears weight. Articular cartilage has no blood supply. It is solely dependent on another joint component, synovial fluid, to deliver vital components and act as a lubricant and cushion between the bones. Age and work degrade the quality of the synovial fluid, which in turn diminishes the quality of the articular cartilage. The joint then loses its protection against friction, concussion, and the invasion of destructive inflammatory cells. Why Feed A Joint Supplement? 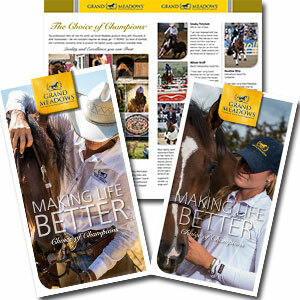 High-quality joint supplements are a great way to help support your horse’s defense against the degenerative process. Starting this program before your horse shows any sign of joint discomfort is the best way to prolong joint health and the peak performance that comes with it. Microscopic activity is going on in our horses’ joints every day, no matter what he’s doing. Healthy, well-formed and unstressed joints naturally maintain a fragile and complex balance between breakdown and repair of components. Imbalances can occur when the joint is physically stressed by work, an injury or age triggering an increased demand for joint-building components that outstrips the natural supply. This can lead to the progressive deterioration of joint cartilage, bone and soft tissues. Glucosamine is the most widely researched of the many joint support ingredients referred to as “nutraceuticals”, it is a water-soluble amino monosaccharide that is the fundamental building block for articular cartilage. (1)(2) It is derived from the hydrolysis of crustacean exoskeletons which produce chitin. Glucosamine is the precursor for stimulating the major structural components of joint cartilage called glycosaminoglycans (GAG’s), hyaluronate, collagen, chondroitin and keratin sulfates. (3)(4), Glucosamine, is safe and will not affect insulin resistant horses. 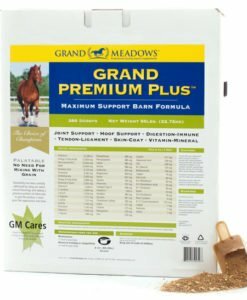 Glucosamine serves a dual purpose by supporting the horse’s ability to neutralize the destructive free radicals and enzymes that can break down cartilage and then supplying ingredients to the cartilage cells (chondrocytes) and helping the transport of waste products away from the cartilage. (5) Glucosamine is available as glucosamine hydrochloride HCL or Glucosamine Sulfate. Glucosamine HCL is the most efficient form with a bioavailability of 98% through the stomach and subsequently to various biosynthetic pathways, which includes synthesis of cartilage and GAG’s. (6)(7) Glucosamine Sulfate contains only 50-60% active glucosamine and the remainder are sulfur salts. Hyaluronic Acid (HA) is an integral component of joint cartilage and joint fluid known as a glycosaminoglycan that is distributed throughout connective tissues and produces both lubrication and shock absorption while blocking inflammatory reactions. It can be very large, with its molecular weight often reaching over a million daltons. One of the chief components of the extracellular matrix, hyaluronic acid contributes significantly to cell proliferation. It has been widely used successfully for many years in an injectable form delivered either by IA or IV. (10) The absorption and the effectiveness of HA when delivered orally was, and continues to be, a legitimate concern of veterinarians, biochemists and nutritionists due to the molecular weight and structure. At Grand Meadows we waited two years to develop a product after the initial introduction of many oral HA products, due to lack of clinical research showing effective bioavailability. We chose Kolla II®, with its extensive research and clinical studies, resulting in three US Patents for ideal molecular weight and it’s ability to maintain natural structure. Kolla II® helps to keep the long chain of amino acids intact with a precise genetic code, allowing for maximum absorption and assimilation of the HA molecule. (12)(13)(14) Kolla II® combines HA in a unique matrix of Type II collagen and depolymerized chondroitin sulfate, which are all important components of cartilage tissue, tendons and ligaments. Chondroitin Sulfate has long been considered an essential partner with glucosamine in joint support products. This sulfated glycosaminoglycan (GAG) is an important part of cartilage structure and a key component in helping joints resist compression. Chondroitin sulfate is generally sourced from bovine or porcine trachea. There is an important distinction between chondroitin sulfate and standard chondroitin. Several research studies have concluded poor oral absorption and bioavailability characteristics of standard chondroitin: less than 6% in some cases. (17)(18) The other concern, which has been substantiated in multiple random testing programs conducted by the National Animal Supplement Council, is that the purity of standard chondroitin is hugely variable and the chances of a product matching a stated label claim are very slim. Grand Meadows uses a low molecular weight chondroitin that is in the Kolla 11® and is proven to be a purer and more bioavailable source of the ingredient. Collagen Type II represents 95% of the collagen found in the articular cartilage tissue. Collagen is the primary structural protein in connective tissue found in tendons, ligaments, bone cartilage and skin. Type II collagen is found in articular cartilage in the form of thin fibrils that provide tensile strength and that closely interact with proteoglycans and glycosaminoglycans to hold the gel-like cartilage together. (12)(13) Type II collagen provides strength, lubrication, resiliency and studies demonstrate it stimulates growth of the articular cartilage. As your horses age their body’s ability to make collagen protein slows down and can become insufficient. Look for FDA-approved manufacturing facilities – All Grand Meadows Products are manufactured in an FDA audited manufacturing facility located in California and have earned exceptional marks from the NASC for our high quality control and manufacturing processes that ensure safe, pure, potent and effective products. At Grand Meadows all our formulas are backed by science and research. For further reading, review the research articles below.